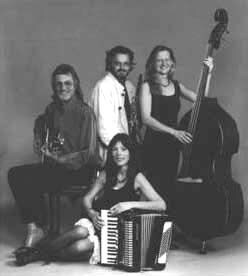 Three or four piece tango band with accordion, guitar and double bass, adding clarinet or fiddle for the four piece. Tango Select features Tim Hill on clarinet, Jacqui Doe on accordion, Keith Allen on guitar and Sarah Luton on double-bass. Their combination of diverse musical backgrounds has resulted in exciting, alluring and emotive music, reviving the almost forgotten sound of Tango. Tango Select plays a range of styles, blending European influences and traditional flavours to create a memorable sound. Jacqui studied piano under Erik Parkin in Reading and accordion under Mario Conway at Cardiff College of Music and Drama. She now teaches piano and flute privately and plays with Sarah Luton in the duo Paris Moon. A multi-instrumentalist, she plays accordion, flute, saxophone and keyboards in the folk-rock band Sardar Wind with Keith Allen. Keith’s musical career began as lead vocalist and harmonica player in the blues/rock idiom. He has played with bands as diverse as ‘Hawkwind’ and ‘Fairport Convention’. He also played drums for four years during which time he was a member of Marty Wilde’s band. Musician, composer and instrument maker, Tim plays saxophone, clarinet and flute in various line-ups, ranging from the ten-piece Pandemonium Band to the jazz trio Mandrake. He plays and researches English folk and church music in The Mellstock Band as seen in TV productions of ‘Pride and Prejudice’ and ‘Tess of the D’ Urbervilles’ and the film of Thomas Hardy’s ‘The Woodlanders’. Sarah started as a classical musician in the Newbury Symphony Orchestra. She is now a member of the folk band Sensible Shoes and plays Musette (French Cafe Music) on double-bass and English concertina in Paris Moon with Jacqui Doe. Sarah also works as a professional artist.